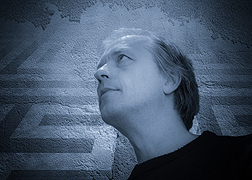 Erik Wøllo is often cited as creating music inspired by his Norwegian homeland. But could it be that the true destination of his work is somewhere beyond self and country? 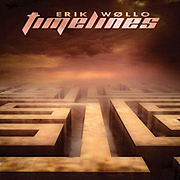 The album Timelines (54'33") conjures a distinctive mindscape and offers so many easy pleasures. A personal journey of lingering resonance Wøllo's nine compositions spin by as the listening mind cuts away from its flow of words to a realm of sound and ideas. Partitioning choral and orchestral forces into distilled hauntingly repetitive ideas Timelines rolls forward, never straight, with steady grooves in compelling restraint. Percussion loops give off a Jazzy flair with breathing chords and a churning pulse searching the horizon. Reverberant piano notes order simple melodies within bobbing rhythms and acoustic guitar picking. Well-paced within these neo-minimalist arrangements Wøllo casts his bending then sustaining electric guitar lines. From an ethereal glow to an earthy growl this playing brings attention to his own cool authority. With equal parts meant for the head and heart we cannot resist the uncommon pull of this album. A celebration of the imagination the poetic contemplations on Timelines will leave us with the feeling that we have something to think about - and with a more invigorated outlook on reality.